The Halloween projects just keep rolling out. I have to say, I do not do much halfway. In life I am all or nothing. It is Halloween, I like creating, so I go all out creating for Halloween decor. I cannot sew at all, honestly. A straight line is too complicated for me, so sewing my kids cute and adorable Halloween costumes is out. 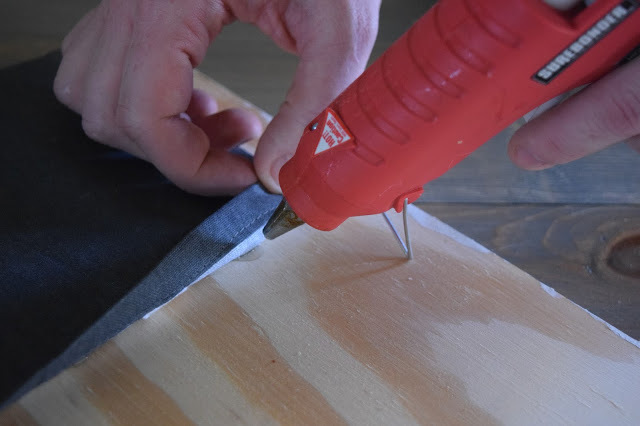 I do have a glue gun, and I do know how to use it! 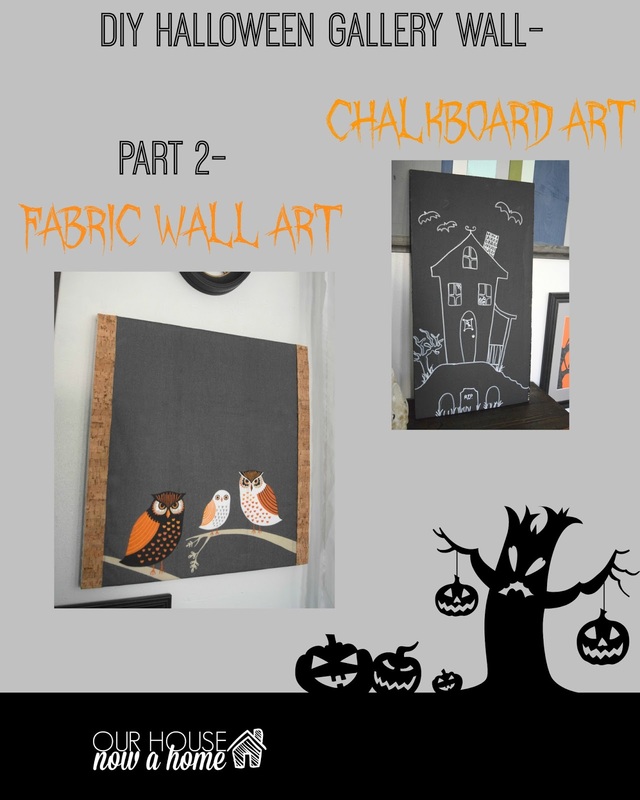 Today marks part 2 of the trilogy that is creating a DIY Halloween gallery wall. I shared part 1 here. I made some simple chalkboard signs for the season. 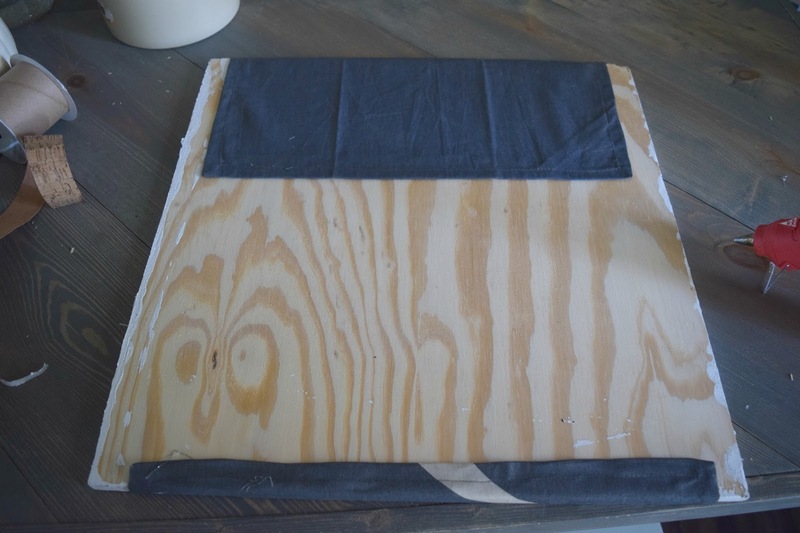 Today it is about using the fabric for some fun and simple wall art. We all know I am not using it to make pillows or anything fancy. I purchased these two small napkins on sale at Walmart last year. They were marked down to I believe 50 cents or something crazy. 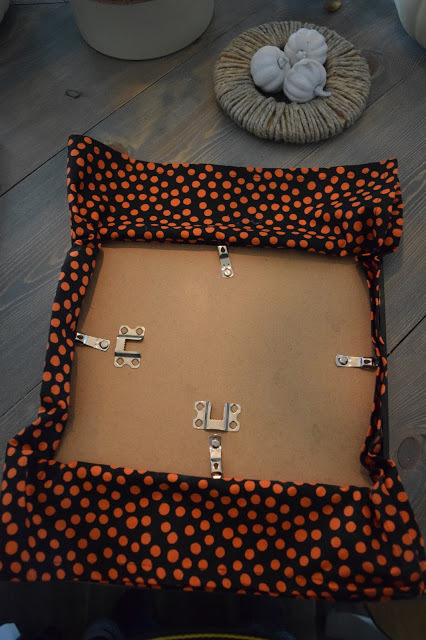 The plan was to magically learn to sew and make some cushy and comfy pillows for this years Halloween. That did not happen, I do not have a sewing fairy godmother or a bunch of mice who will sew things for me while singing. Like I said, a glue gun is my friend. So I am using these the only way I know how. I used one of the fabrics and set it in a frame I had. This frame was in Nora’s room when she was a tiny baby. She felt her bedroom was too cluttered so there frames came out. I set the material in the frame, pulling it tight. Because I am a fancy lady, and we only do the best around here. I used some painters tape to make the fabric be close to the frame in the back. I know, impressed with my obvious ladylike and proper decorating skills. 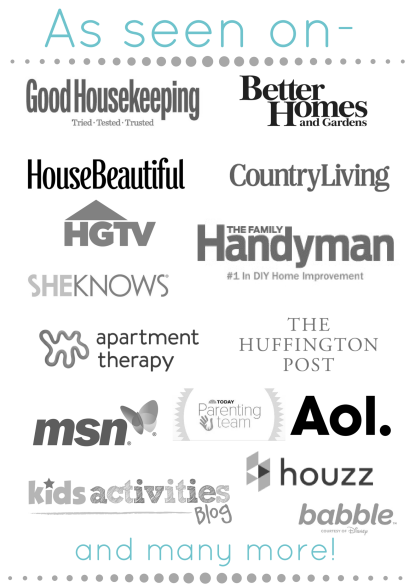 This just goes to show that DIY does not have to be pretty, well the process of it. 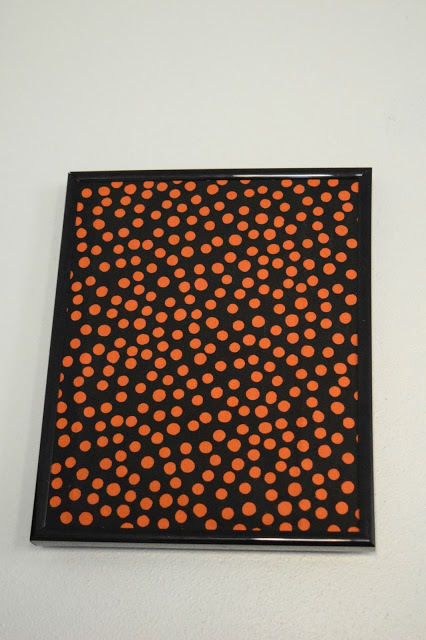 I end up with a fun pattern at wall art for Halloween. No one is any wiser about the hot mess that is the back of this frame. Except for anyone reading this blog. It is ok though, I am fairly certain non of my family read this blog. 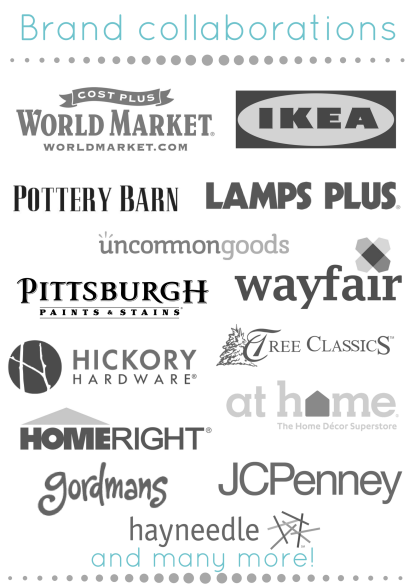 It is a lot of paint colors and home decor talk. Not many are interested. So the people visiting my home just see the pretty wall. I also have zero shame and would probably show off the back of this if someone asked how I did it. 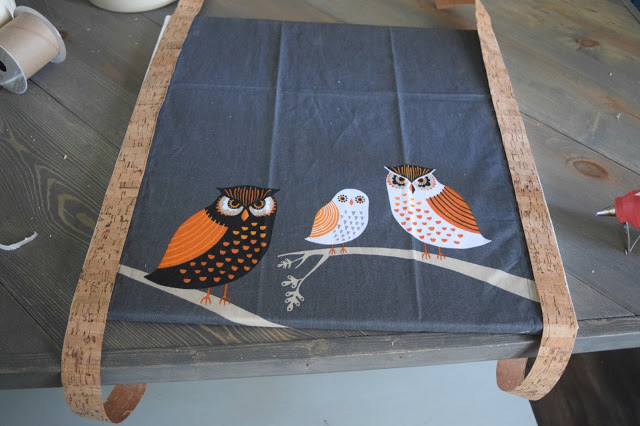 The next plan was to use my other napkin fabric, this one has owls. 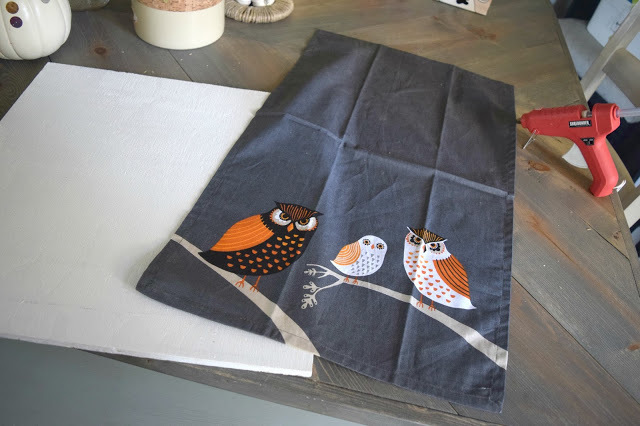 I adore owls and woodland creatures! I had this board that I planned to use for this. 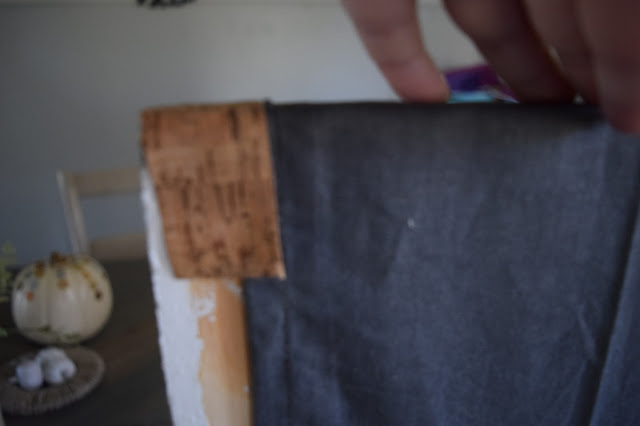 I pulled the fabric tight, and centered it within the board. Then using my hot glue gun and was generous in lathering it on. I liked the look of it but this did not feel done to me. 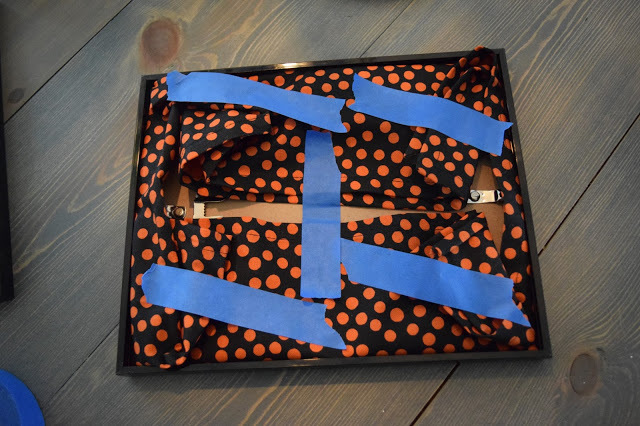 I used this wood ribbon I had to frame in the fabric. Putting it on either side. I used the hot glue gun to glue the front sides, then wrapped the wood ribbon around the back to secure it. 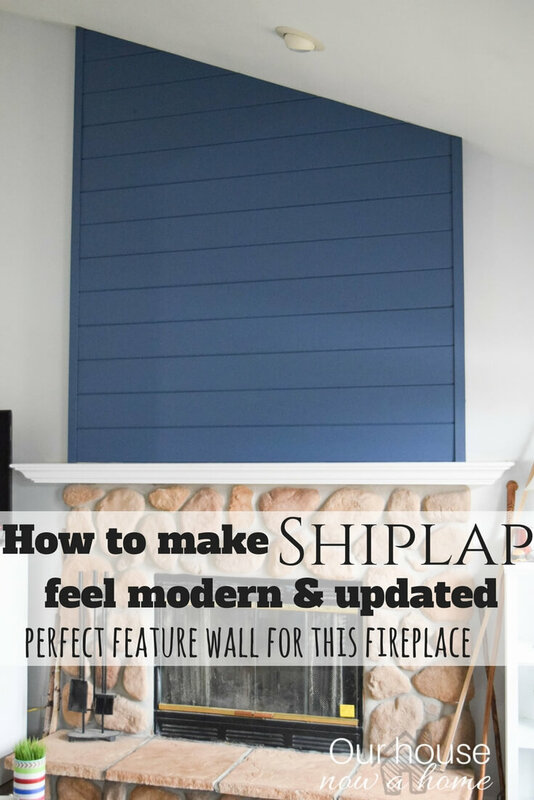 Here is my secret for this gallery wall. This is in no way a sponsored post. I bought these all on my own, as I have done for years. 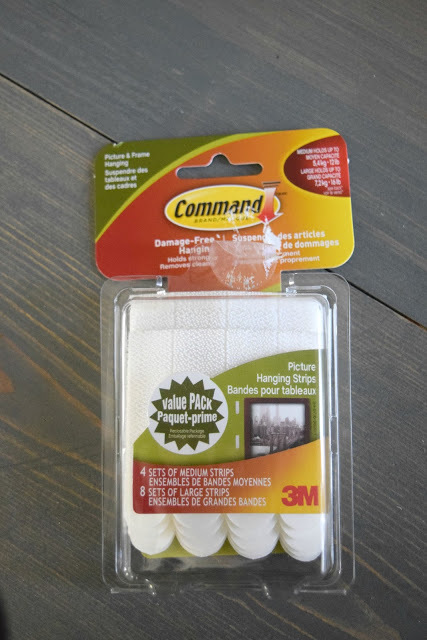 They are wonderful little things that allow you to hang things without damaging paint or putting in a bunch of holes in your wall. This is so important for this project. I adore a good gallery wall and have more then I probably should in my home. Most are fairly permanent. This Halloween one is not. It will be coming down in a few weeks. Which is why it was important to keep the cost low, the damage and holes to my wall to a minimum. These on the back of my wall art is the secret to my eventual clean and hole free walls. I am so happy with how these turned out. 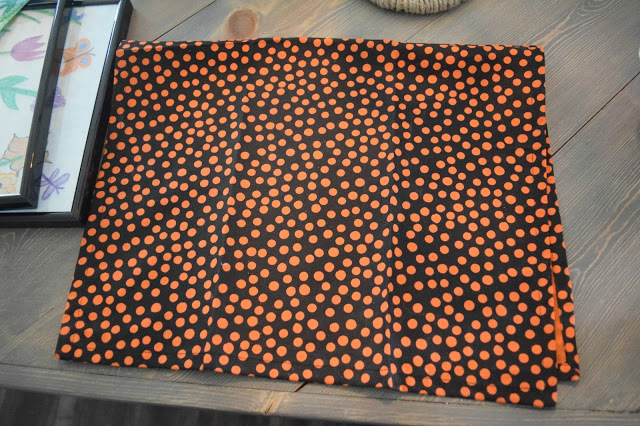 My attempt at a pillow would have been a hot mess that most likely would have ruined this fabric for good. Wood, glue, and command strips. That I can do. This is yet another project of showing how decorating for a holiday does not have to be a big deal. I love all of the bright fabrics and patterns this time of year. Now, don’t get me wrong…. once January comes along I am pops of colored out. Give me some light and neutral tones. For now this is all new and makes my home feel so comfy and cozy. This Friday I will have the full reveal for this Halloween gallery wall as well as two more pieces I added to finish off this project. 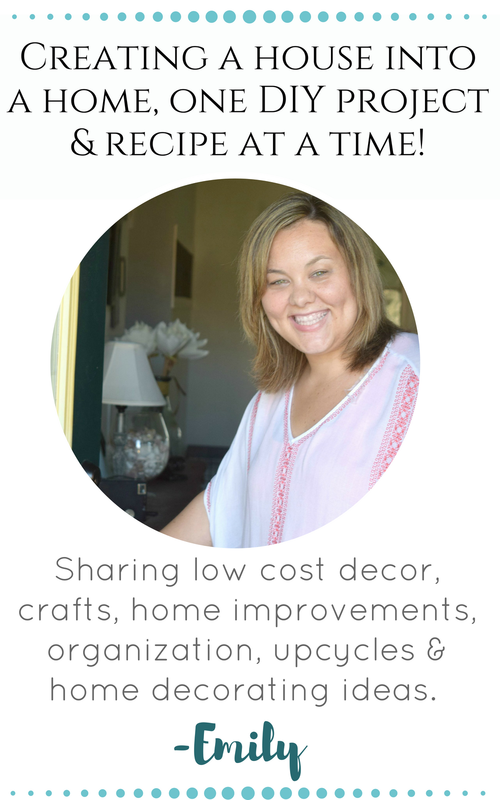 I have a One room challenge update, a dining room reveal all coming up this week I decided I was not doing enough that in between working on the laundry room, my boys’ bedroom, holiday decor and everything else I figured a dining room revamp was needed. 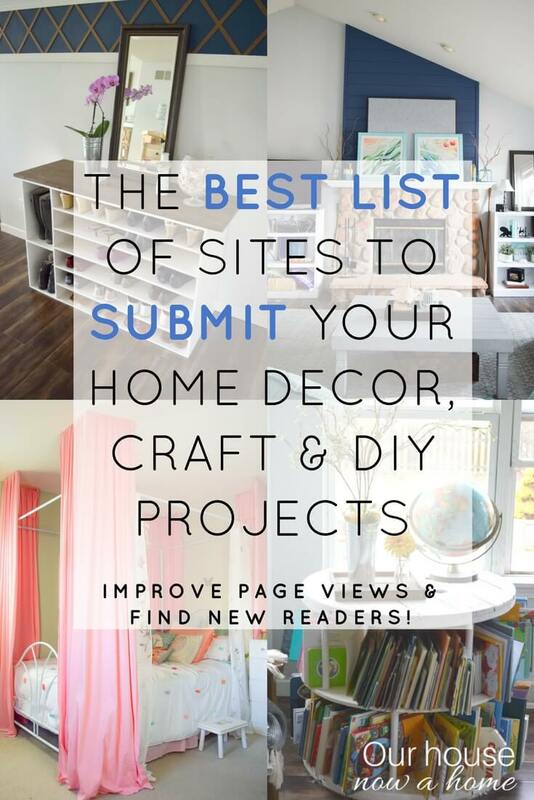 I am a decorating addict, and I need my hit of it. Just a little wall color, maybe some wood pallets. I get the decorating shakes if I don’t have my fix. 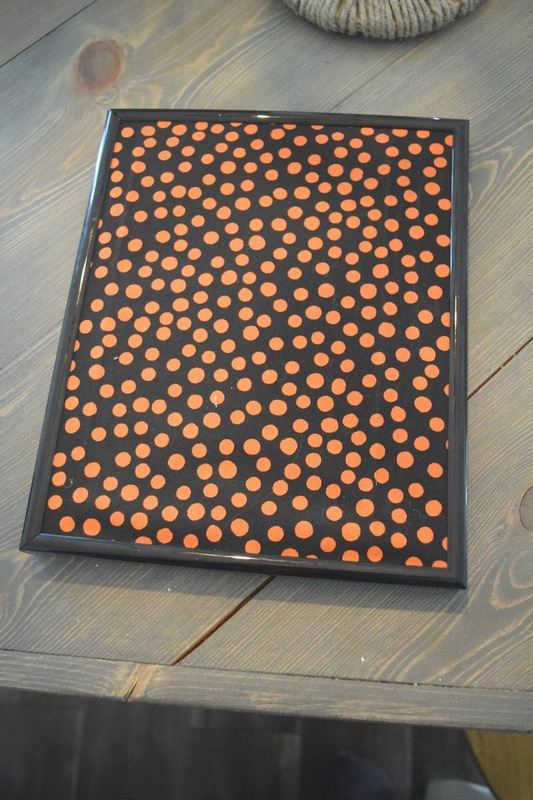 See the dining room revamp all started with a new ceiling light…. I am sure you can see how it escalated. Lots of happenings here for the rest of the week! How cute this is! I love the owls! Thank you! It was super quick and simple to make. These are SO cute!! Especially the owl one, I love anything with owls on! I love the owl fabric too! Adorable! I'm pretty sure that you are the craftiest person that I know! Oh wow, thank you! I do enjoy making things! These are adorable and easy, I love them! This turned out cute! 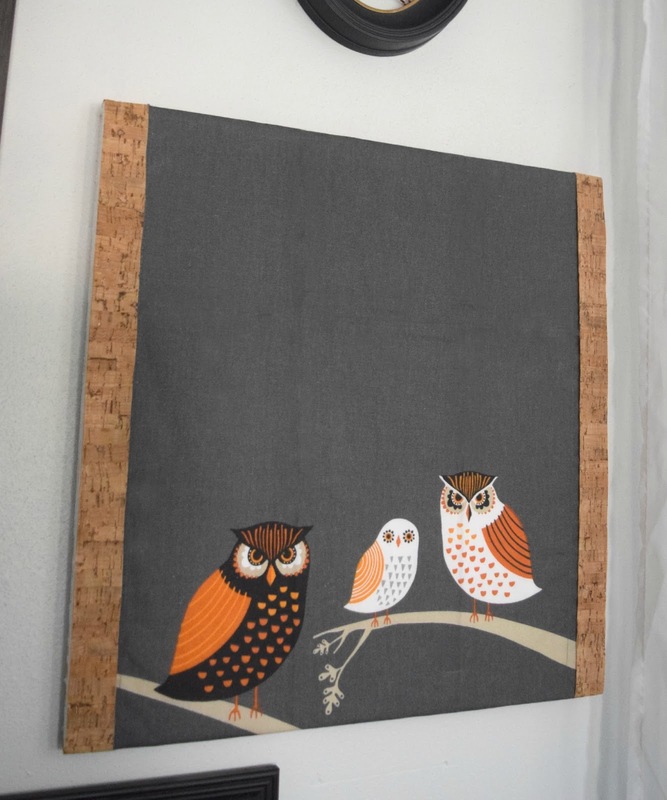 love the owl fabric and faux wood ribbon. I love your Halloween art! What a great addition to the wall, I only usually add holiday stuff here and there, but the wall art makes such a huge difference. Very nice! What a great idea using the command stick things! I don't usually do too many fall or Holiday art because I never liked the idea of making the holes in the wall for a temporary piece. But the command strips make all of that not a problem. This is very a very cute idea! I really like the owls! It fits in so well with the season! How amazingly creative! I've been searching for gallery wall ideas but have never seen a fabric art one…I love it! Thanks so much for sharing! Fabrics always have so much color, pattern and options. 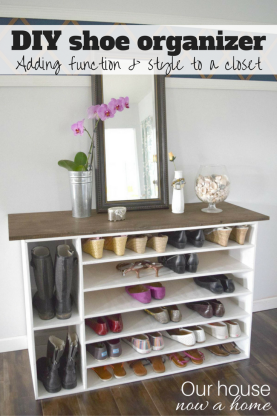 Adding them to a gallery wall is a great idea to keep things simple and fun! Emily! I LOVE these! Especially the owl one, adorable!! I love anything that is no sew. I'm hoping to be so much better about Halloween next year, still getting moved into the house…after 10 months! Thanks for sharing!! Thank you so much! I am all for the no sew too. You will have plenty of time to decorate for Halloween next year. You have been crazy busy with projects as is. I love your ideas! The owl one is so fun! 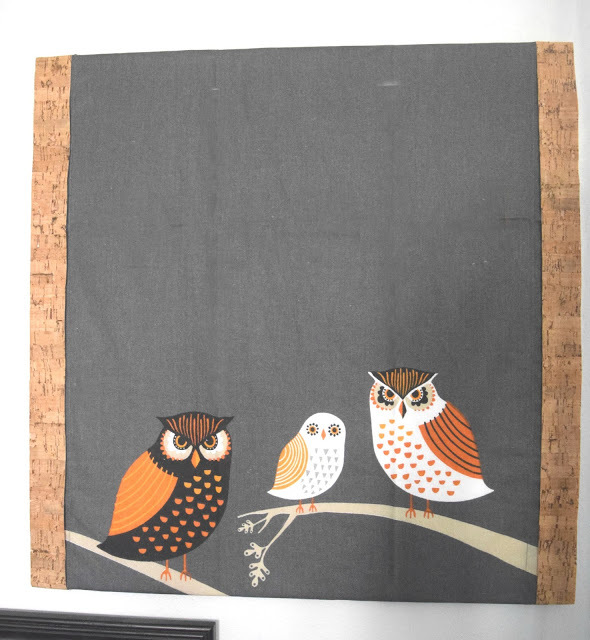 Those owls are just adorable and I love the wood ribbon. Adorable! Love the little owls!! I'm loving the owls! What a creative diy. Thank you for sharing. So simple and yet so cool looking.